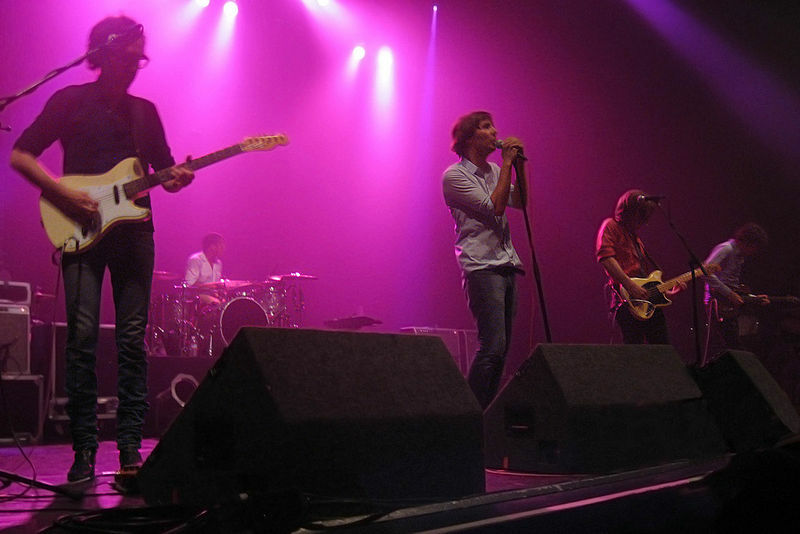 When Thomas Mars and his French band mates released their new album “Bankrupt!” this summer, they were fresh off of an electrifying set on the Saturday Night Live stage, showcasing two new songs, “Entertainment,” the lead single from the album, and “Drakkar Noir.” Those two tracks were musically unlike anything Phoenix had ever produced, but they were both still tinged with Mars’ signature teen-indie-pop chanting. Now returning from a festival-filled summer, including a trip to Lollapalooza, Phoenix can revel in the shade of their top-to-bottom solid LP. The album opens up with “Entertainment,” a synth-washed ode to excess and capitalism. Mars is on point, singing verses over palm-muted guitars and pounding toms. The track starts and ends in lovable chaos, with everything from changes in time signature to Japanese inspired synthesizer riffs in between. Opening with airy synth, drum and claps, “Trying to Be Cool” is the “coolest” song on this album. Mars discusses the confessions of many men trying to get a girl: “I’m just trying to be cool.” Well-placed keyboard solos carry this track. Although this is a great song, it also can get old listening to a rock star sing about “trying” to be cool, when we all know he is. The title track, “Bankrupt!”, has to be the most all-over-the-place song I might have ever heard. Starting with acoustic guitar, this record runs the gamut of instruments from a Rhodes keyboard, to crunchy synthesizer, chimes, harpsichord and pads. The plethora of instrument, however, is the only impressive thing about this song. I could have done without the addition of the out-of-place and forced vocals within this awesome six-minute jam session that most likely was created due to insomnia, which always make for the best songs. “Drakkar Noir” and “Chloroform” team up as two songs that rely on chord hits and the drumming of Thomas Hedlund to drive them. “Drakkar Noir” has hints of Fleetwood Mac within, and even a nod back to Phoenix’s own “Too Young.” These two songs, however, lead us to my personal favorite on the album. “Don’t” begins with a keyboard mess, all culminating into a snare heavy, 80s teen cruising tune that could easily be mistaken for appearing on the soundtrack of “Fast Times.” Even the lyrics, as Mars’ proclaims “reach out for me,” sound like the epitome of the 80s: emotions. After a quick stint with awkward “Bourgeois,” Phoenix finishes this album off as intense as they started with “Oblique City.” Filled with Phil Collinsesque tom fills, arpeggiated synthesizer the entirety of the song and, of course, our dude Mars wailing over it all, “Oblique City” brings “Bankrupt!” to a satisfying and fulfilling close. I cannot wait to see what this band does next.